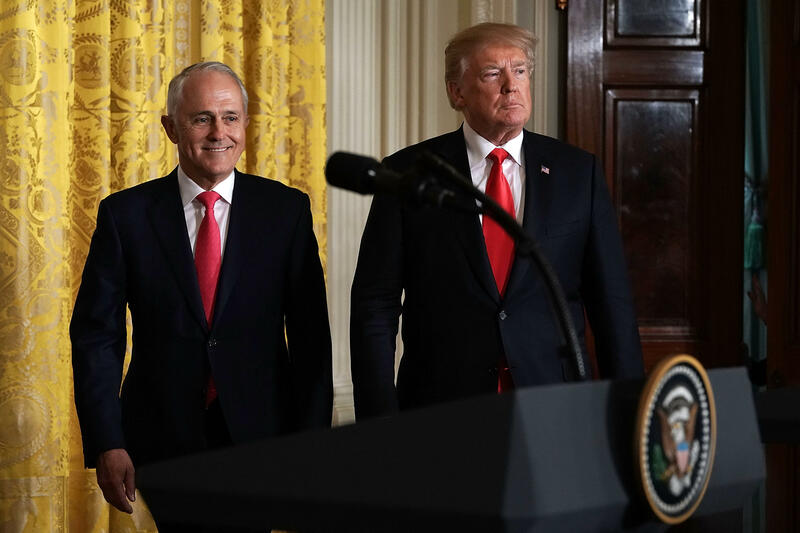 Prime Minister of Australia Malcolm Turnbull tweeted a video on Monday saying his country has achieved a "commitment" from President Trump that his tariff plan on steel and aluminum won't apply to exports from Australia. Mr. Trump signed proclamations for his new steel and aluminum tariffs last Thursday -- 25 percent on steel imports and 10 percent on aluminum imports -- which will go into effect in a little over two weeks. "This is very important for the thousands of people who rely on these industries for work," Turnbull tweeted. "This is a win-win decision," he said in his video message. Alluding to the breakthrough, while not explicitly naming Mr. Trump, he said, "You've got to keep at it, you have to be relentless and if there's a setback, you just keep going find another approach." Mr. Trump hinted at being more lenient toward allies like Canada, Mexico and Australia during a Cabinet meeting last week. He said both Canada and Mexico would be exempted until the North American Free Trade Agreement (NAFTA) is successfully renegotiated. He said his administration is going to be "very fair" and "very flexible" with other countries but that he still had the "right" to add or exempt countries to his tariff plan. "We just want fairness," Mr. Trump said. On Friday, Mr. Trump tweeted that he had spoken with Turnbull over the phone and that he was "committed to having a very fair and reciprocal military and trade relationship." He added, "Working very quickly on a security agreement so we don't have to impose steel or aluminum tariffs on our ally, the great nation of Australia!" The flexibility in exemptions comes as the administration was put on the defensive last week over fears that the president's plan could lead to an all-out trade war with allied countries or trade partners -- something the president himself embraced as being "not so bad." "We are not looking to get into trade wars. We are looking to make sure that U.S. companies can compete fairly around the world," Treasury Secretary Steve Mnuchin said last Tuesday on Capitol Hill. Commerce Secretary Wilbur Ross echoed that sentiment, saying in an interview with CNBC, "We're not trying to blow up the world. There's no intention of that."